Ismaki sketch this week was set by Claudia. which says 'yee haw' but colours are a bit bright in photo . Don't have time to do a list of materials but main bits apart from the image are cut from various sizzix dies. 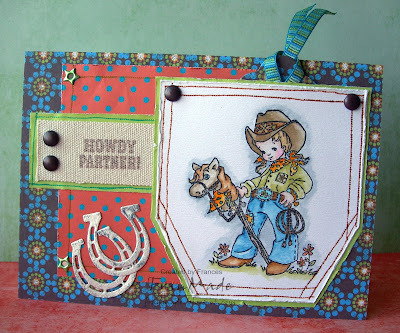 'Howdy partner' is from pink cat studio 'billy set'. Canvas it was stamped on is actually from price tag/label from a Primark top! Received this funky looking award off Jennifer the other day which was a lovely surprise - thank you! I have to admit, I didn't even know Jennifer read my blog which made it even more special so I would like to pass this on to all my other readers that I don't know about :D - you're the reason I try to update my blog as often as I can! Have a gorgeous day, hope the sun is shining like it is here. Final folder card with those papers! O.K had to use up the last of the papers and had a question about how to make the folder card so thought I'd kill 2 birds with one stone and do another folder card with quick photo instructions Used another sweet art ebony stamp for this ('kitten'), just got 1 more to make now! That's all there is to it. You then decorate as you wish. Here's the folder from side view. Off to work now. Have a good weekend! Here's the other card I managed to complete last night. 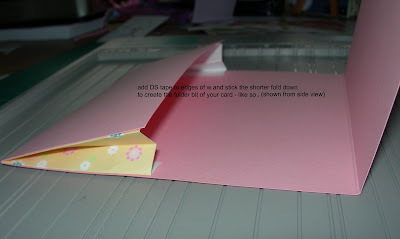 Really liked the last folder card I did (below this one) as it's so quick to fold and make up. I still had lots of DP left over from my CCT card but used a pale green card base this time and it does change the look so hopefully you won't get sick of looking at the same colours again! 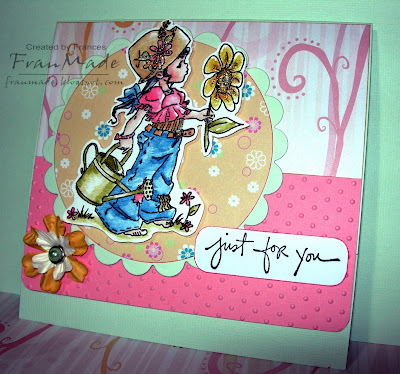 Used the sketch on this week's Friday Sketchers and as I used a summery nellie stamp (yep, the 4th of my 6 Sweet Ebony stamps, just 2 more to use) it fits the first challenge over on Spoonful of sugar (summer time theme). 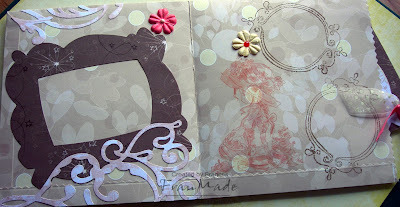 Others: used circle nestabilities for the circles and swiss dots embossing folder on pink piece. Flowers/brad from stash. Was supposed to stick 2 more gems top right of card but forgot before I took photo! 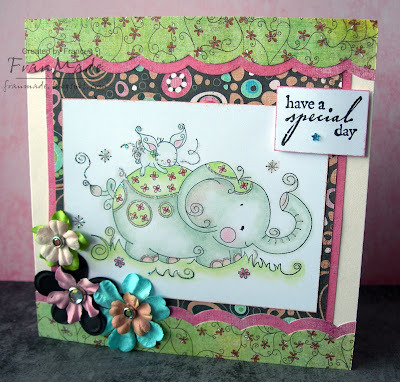 Theme this week over on Cute Card Thursday is patterned papers (to tie in with the blog candy on offer this week). So nice and easy theme this week. I chose to ink up one of my new Tildas and the beautiful bunch of magnolias which I fell in love with. Thought it'd be perfect to make a folder card to put Magnolia images in !! Papers: from DCWV spring stack (last years I think) left over from an earlier card as they are 12x12 so still got some more to use up (will see it again in my next card)! Will be back later, to post another card I managed to complete today/last night (I'm actually typing this late at night but put it on schedule post for the morning so gets confusing what tense I should be using! This week's Tilda ATC theme is 'beside the sea'. Ran late as usual and only managed to get this done last night (it was still wet when I took the photo!) so a quickie this week! 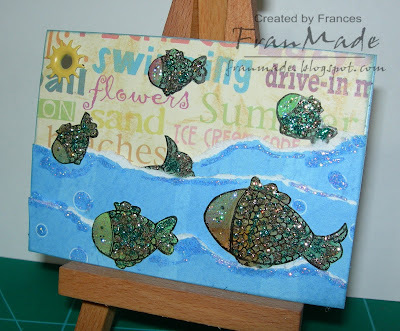 Used my Magnolia fish for this, stamped onto some scrap paper I made a couple of weeks ago using alcohol inks. Background made from torn bits of DP from my scrap box. Used lots & lots of stickles on the fish and edges of the water then finished off with a sun eyelet. That's it! Hope you can find time to play as all entries will go into draw. 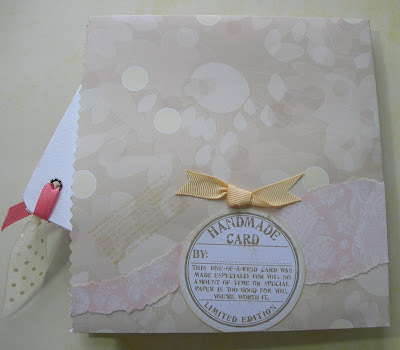 Winner will get some stamped images and shell embellishments (see blog here for details). I'm back! No post yesterday as busy sorting room out, finally! Was ruthless and finally got rid of loads of magazines which were just taking up space and collecting dust. Think I nearly managed to fill most of our recycle bin up - good job the binmen don't have to hoist them up on their backs anymore else they'd do themselves serious damage! Haven't had the downpour parts of south UK have and it was relatively o.k yesterday with more of the same non descript 'blah' today. To top it all we had powercut in our area today, for one hour. Don't realise how much we use electricity until it's gone! Thank goodness they fixed it, whatever it was, relatively quickly. I'm back! Couldn't stay away till tomorrow =). Did I manage to clear out my craft room? did I heck! LOL Instead I had all these stamped images whispering 'colour me in' and I just couldn't ignore them and guess who whispered loudest? yep, anothor 'Sweet Art Ebony' (visit Elisabeth's blog to see all her fab art and potential future stamp images!) - just can't stop colouring in these cuties. Thought I'd colour her hair black (seeing as mine is) and have to say she looks like a little chinese girl - what do you think?! Papers: DCWV spring stack. Aqua one is papermania handmade paper. Used edge distresser on all edges and added faux stitching. Others: cuttlebug die for the 2 ornate corners. flower made with the papers using smallest circle nestabilities with ribbon stitched into centre. Didn't make it for any challenge in mind but having completed it I think I can enter it for this week's Stamp Something challenge which is 'faux something'. I've used faux stitches on mine. I know I said I wouldn't be posting till Mon but last two days I've had 'rubba' landing on my door like buses all at once so had to ink at least 1 of them up plus I've been given some more awards so thought I'd best put those on before I forget again! The 2nd award I got, makes me laugh, which is rather appropriate as it came from Debby and I always find her blog entertaining and her creations are always fab! It's this, the 'circle of friends' award, fab isn't it?! Again everyone who comes visit deserves this award but in particular, my fellow DT members on Tilda & Friends ATC and Cute Card Thursdays! Now if you've managed to read this far its only fair that I should leave you with something to look at, but nothing fancy! 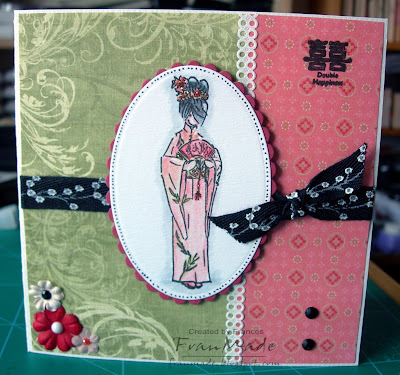 This was a quick card I made using one of the fab Kerry Jo stamps. They're clear acrylic stamps and you get 12 absolutely brilliant designs for only £14.99 (that's £1.25 each!). I first came across Kerry Jo on the do crafts forum and couldn't believe how lovely her hand drawn 'doodles' were in her gallery and have been waiting so long for them to be finally turned into stamps! Papers are scraps from an earlier card, the 'double happiness' chinese character is from woodware set, everything else from stash. There's something for all girls on this sheet - funky fairy, pretty fairy, rock chick, ballerina, cowgirl, pirate, birthday girl, witch , . . .love em all! O.K on that note, have a lovely weekend, hope it's not too much of a washout, think the sun's trying to come out here - hope you have better luck! 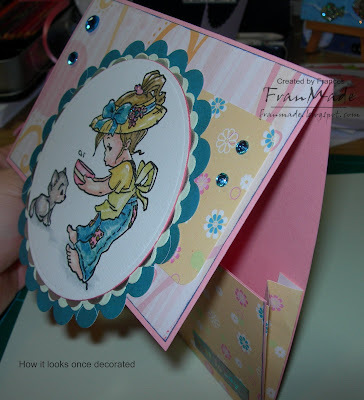 Here's the 2nd card for today, using the fab PTW sketch challenge set by Katharina. Papers: K & Co McKenna paper pad. 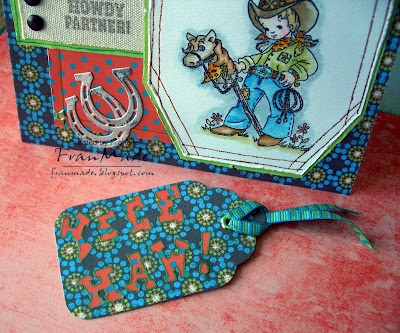 Others: Cuttlebug paisley embossing folder used on base card. Flowers, brads and gems from stash. 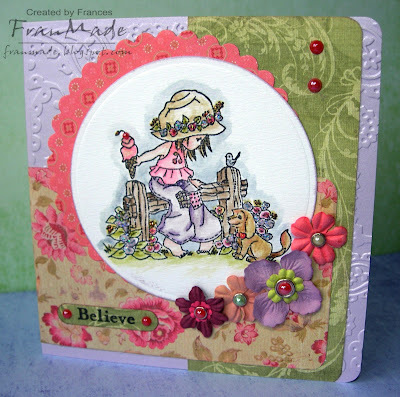 'Believe' from Making Memories magnetic stamp set I've had for donkeys! cut out with SU word window punch. It's just so easy to make something with this range of stamps, I can't stop! I also had a lovely unexpected e-mail from Elisabeth, the designer of these gorgeous stamps, to say she loved what I did with the Picking apples one I posted the other day! 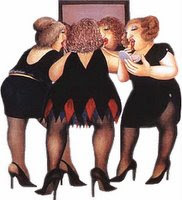 I was one happy bunny, as I took that as a wonderful compliment coming from someone as talented as Elisabeth is (and she's even mentioned little 'ol me on her blog :D) If you've not seen her work you need to, I love the whimsical/nostalgic look to her illustrations. Can't wait for more, I'm well and truely hooked on them! On that note, I shall leave you - have a fab bank hol weekend. Shall not post now till Mon probably (need to catch up on my blog hopping and sort out my craft room in between working). On a roll today, have made 2 more cards (subconscious must know I need to unleash my craftiness before it get's bottled up for work at the weekend =) ). This one I started last night and finished this morning. It's using the sketch over on Friday Sketchers and also fits the 'animal' theme over on DCM. So have just made it in time as both will have new challenges up tomorrow! 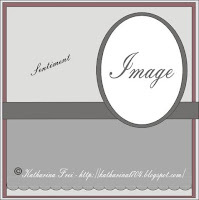 Others: Quickcutz scallop border die used. Flowers, brads and gem from stash. Finally starting to stop hoarding and saving my 'nice' papers and am using them more now! Now I just have the problem of an ever expanding scrap box. Also think I need to have another craft room clean. 'Things' have started to build up again and need to find new homes for my latest batch of stamps and bits- you know what I mean ;)?! I've used a Sarah Kay image I was given a while ago but have been hoarding! (as this stamp is no longer available but there are some new Sarah Kay ones due out in June - can't wait! Just can't get enough of these types of images). Finally taken the plunge and coloured her in as all my new Sweet Art Ebony stamps has got me in the mood and also because I didn't want to use my new stamps as I had a feeling some of the other girls on the DT would be using them too! Images: Sarah Kay image, (don't know name sorry) coloured with distress inks - find these images are very intricate and easier to colour this way rather than prismas. the tones suit them better too I think. Rose above the ribbon is a Magnolia stamp and is only there to cover up a sticking mishap - my papers didn't quite meet up when I stuck them down! 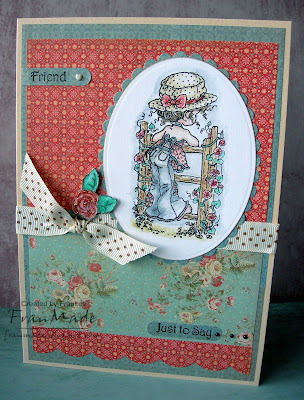 Others: Used Nestabilites dies and quickcutz scallop border die. gems & ribbon from stash. 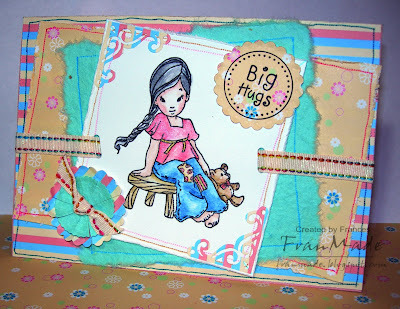 CCT is offering some fab stamps as candy this week, see blog for details and also the other fab DT cards. Might be back later tonight to post another card as it's Fri tomorrow which means work and less crafting time for me. If I don't 'see' you later, have a good day! 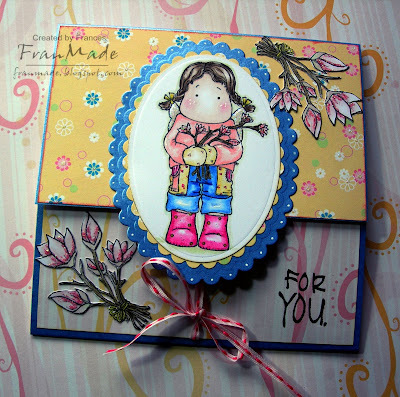 Images: all Magnolia stamps, the tree branch is from the tree swing stamp off the spring club kit. coloured with Prismas/sansodor then covered the moon with 'icicles' stickles. 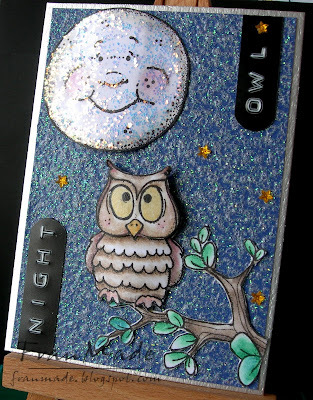 Moon is curved and raised with foam pads as is the owl which has a decoupaged head. 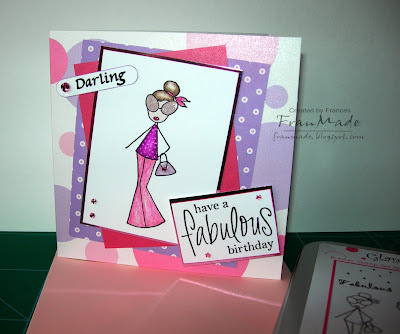 There's a fab Tilda with straws stamp for one lucky person who takes part this week. See ATC blog for details and the other feathery creations from the DT. Have a good day, or if like me, a good evening/night! 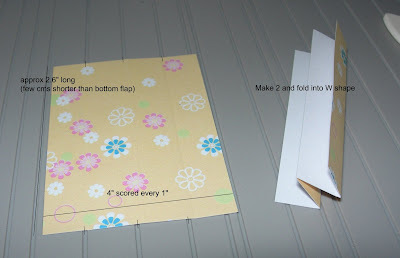 Kristine has fab blog candy on offer where you have to make a card in the style of the bag card she has made here in celebration of her becoming a DT member for Papirgleder (who make the fab Ladybug & Friends stamps). I love Kristine's cards which is very Scandinavian in style and is basically "shabby chic" with distressing, tearing and lots & lots of embellishments, with details both inside and outside, including the back of the card. Well, decided to give it a go today as deadline is tomorrow (!). Didn't have a paperbag but liked the idea of it so made my own out of a piece of 12x12" paper. It's taken me the best part of the day to make this and I now know why I am in awe of this style of card - it takes alot of time and effort! Anyway, here it is, I really enjoyed making it, very different for me, but I liked how it turned out. Think I need more practice with the insides (and have discovered I don't have enough 'flourish' style stamps and need some more embellishments besides ribbon and flowers!) and still not quite shabby/distressed enough! Main image is 'Picking Apples' Sweet Art Ebony stamp (again! told you I love these stamps may have to put up with more as the others arrived today) and everything else is from my craft room which is now very messy! too much going on for me to start listing everything I used! Just ask if you want to know what something is! 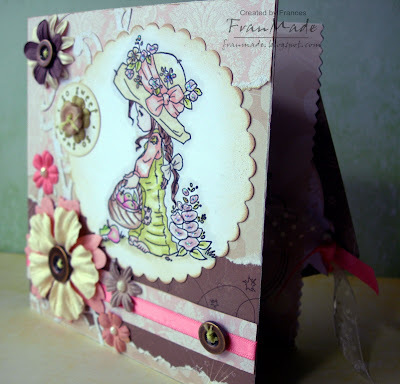 I was lucky enough to win a Sugar Nellie stamp last week when they were giving candy away on their blog in the run up to the release of their new range of stamps, 'Sweet Art Ebony'. Well it arrived today and what a beauty it is too. Luckily I managed to buy the others at the weekend when Funky kits released them before some of them sold out (but don't panic think they will have more in later this week) and I got email today to say it's been sent so I will be stalking the postie tomorrow as I am soooo in love with these stamps. 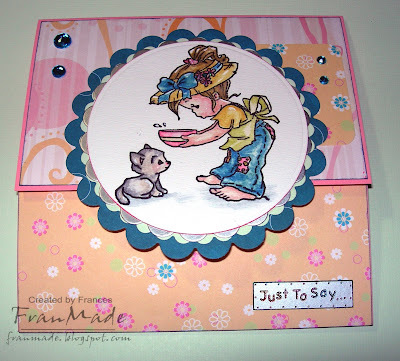 Image: 'Pickin Apples' Sweet Art Ebony range of Sugar Nellie stamps from Funky Kits Watercoloured with distress inks and a touch of stickles. Papers: from English Paper co pack. Used Circle nestabilites for the image and scallop. Circle card made using my Fiskars circle cutter. 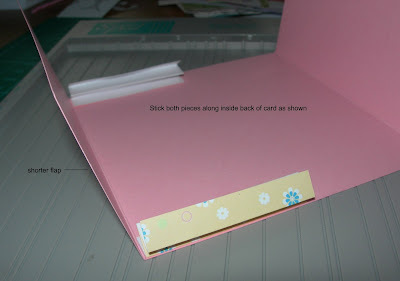 Just cut small straight edge along bottom so that card doesn't roll away! Others: 'sweet' heart is cuttlebug embossing folder. flowers & brads from stash. Image: stamp from Panduro girls set. Love these, so quick and easy to colour in. Used Prismas/Sansodor and stickles glitter on her dotty dress and the heart. 'Merci' sentiment from PB Salutations set. Main central panel is raised on 3d foam but can't tell from angle of photo. 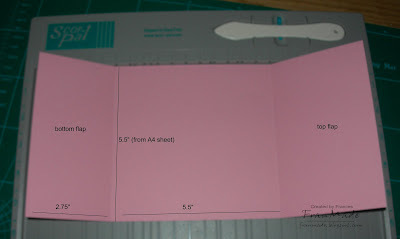 Others: black card for matting, pearlescent pink card blank and brads from stash. I was given this award off Marlene, isn't it pretty?! Thanks lovey, it means a lot to me coming from you! 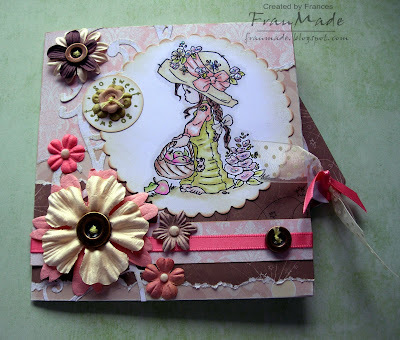 I would have to give it right back to Marlene as not only is she one of my first and bestest blog buddies but her creations are always amazing and truely inspiring. Jo another blogging buddy from the beginning and her creations are always so polished, fresh & fun. Vanessa whom I lured over into this blogging malarky after meeting via our love of Magnolias and is such a lovely person. Just to say . .
CCT: Gems & Jewels "It's all about the presents"